This is a guest post from John Lyotier, Co-Founder of Left of the Dot. First off, thank you Elliot for giving Left of the Dot the opportunity to tell you a bit more about our re-branding and our re-launching of Importers.com. Whenever we take on a brand, we look at several factors before we begin development: what is the natural business model implied by the name, what is happening within the name’s specific vertical, and who are the big players within the domain’s market category. With Importers.com, we discovered a market that was filled with fraud and uncertainty. Trading partners did not trust trading partners. Scandals were plaguing the incumbent market leaders (See: The Economist “Alibaba and the 2,236 Thieves“). And the brand perception among potential consumers was that they “all look the same and seem sketchy”. For us, this spelled opportunity, and it was clear that if we were going to differentiate Importers.com in this market (and resurrect what should have been a dominant global brand before being abandoned by its previous owners), we needed to emphasize the concept of ‘Trust’ first and foremost. You get better click thru rates on your paid search advertising. This increases your quality score and lowers your cost of new customer acquisition. And if it costs me less to get a customer on Importers.com than it does for an upstart brand that nobody has ever heard of… I win. You get ranked higher in search engines. Initially, this was entirely dependent on keyword match, but with the Panda release, how customers or peers perceive your site has become much more of a factor (think of the +1 as a trust endorsement). Customers (and strategic partners) are more willing to listen to you and give you the benefit of the doubt. With this knowledge in our back pocket, we decided to play to our strength. 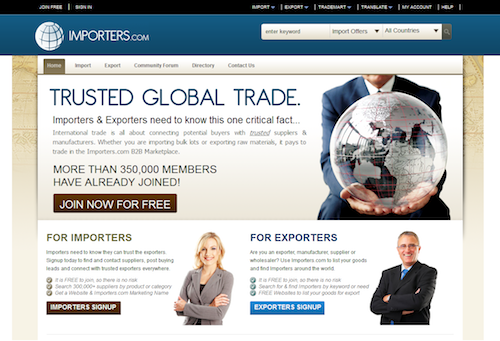 The name “Importers.com” conveys a trusted brand in a market that is screaming for somebody to trust. As we started to peel back the layers of Importers.com, more opportunities opened up. We were able to call on partners that may not have taken our call had we been a “just-born” brand. One of these partners is a group that allows us to do fraud and identity verification as part of a new Importers.com “Trust Certification” program, which now implemented, fosters even more trust between our members. We are also able to convey this intrinsic trust down through the participating members of the Importers.com B2B community through our unique Marketing Name service. For those who don’t know, key to Left of the Dot’s site development strategy (which we feel is a good alternative to domain parking for the very best domain names on the planet) is to allow small businesses to lease sub-domains to the “left of the dot”. For example, a hardwood importer may choose to lease from us Hardwood.Importers.com. When deployed on Importers.com, businesses and trade associations can lease names ranging from $25 to $200 per month. With this model, a business can either have the sub-domain pointed at their existing directory listing [referred to as a Trade Page on Importers.com], redirected to an external website, or with some properties … to a fully-hosted website hosted by Left of the Dot. For the member who has leased Hardwood.Importers.com, he has a brand that he can use in his own marketing campaigns, and in so doing… he leverages the intrinsic trust of the Importers.com domain name. However, deploying our sub-domain platform is but one part of taking on the resurrection of a brand like this. As you know, building a website is hard… but we found that re-building a website is even harder. We had to ensure that we had a website that stood out from the incumbents (visually anyhow), and when a first-time visitor arrives at the site, their experience is aligned with our brand promise of Trust. And with Importers.com, we believe that we have been able to achieve this. 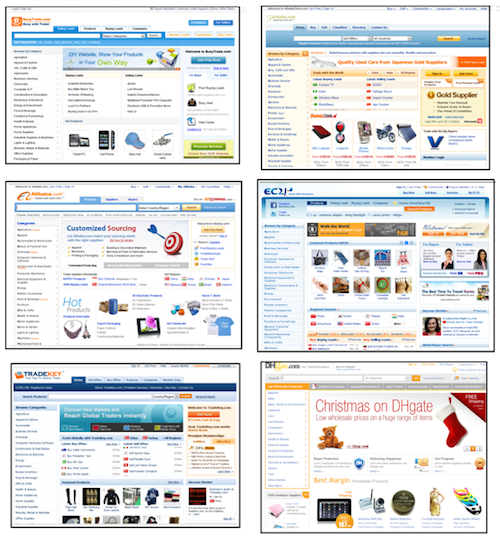 It all started with a domain name in which our client saw un unrealized value and has grown from there. And the result? It is too early to tell, but we believe the brand visually stands out and is recognized as a market leader. The website has 400,000 members, is growing at a rate of about 1,000 new members per week, and has captured the attention of Alibaba and TradeKey (both of which have multi-billion dollar valuations). We have hired a Brand Manager who now lives and breathes the brand and are ramping up an international sales force to help drive revenue for ourselves and our client. In the end, while it will be our members and the market as a whole that will judge how well we did in re-launching this specific domain, we would be interested in the thoughts of the readers. So what do you think? Did we do a good job in conveying trust? To give you a snapshot of the competitors, here is a screenshot of the re-launched Importers.com and the first impression that we give versus a single graphic showing the similarity between the leading companies in the B2B trade marketplace. How about giving me a free trial? I like it. Category killer, and “xxxxx.importers.com” makes perfect sense and rolls off the tongue. @BullS … Forget the free trial. Everyone starts out as a Free (Bronze) Member. Here you have full functionality, you just have less capacity than our paid members (e.g., in the number of categories that you could communicate with). From there, it is our job to show you the benefits of a paid membership.